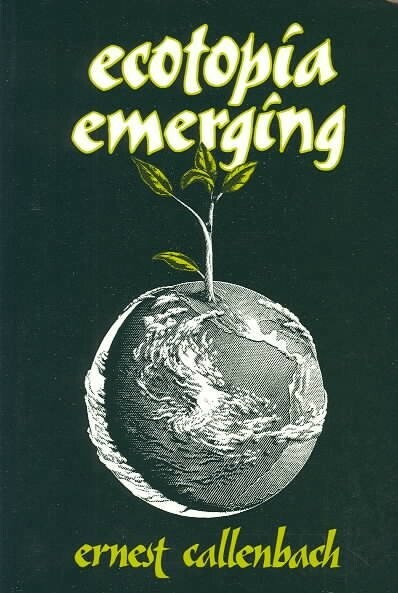 In 1975, a learned man, Ernest Callenbach, wrote of how an ecological republic could break off from the USA, in the Pacific Northwest, with the name Ecotopia. A million copies of this story were sold. On April 16, 2012, Mr. Callenbach died. Much of what he described has happened (bicycles, zero or low emission cars, organic food), but a spinoff of new bio-regions in North America has not once occurred. Will that ever happen? Or never? 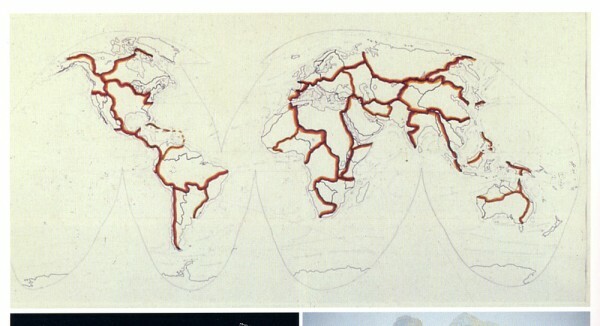 In 1978, Peter Fend entered the art world with maps of eco-regions being saltwater basins. These appeared at shows of Collaborative Projects. Jenny Holzer noticed the work. She asked Fend to join her in a six-person artist team intent on “functional” projects. 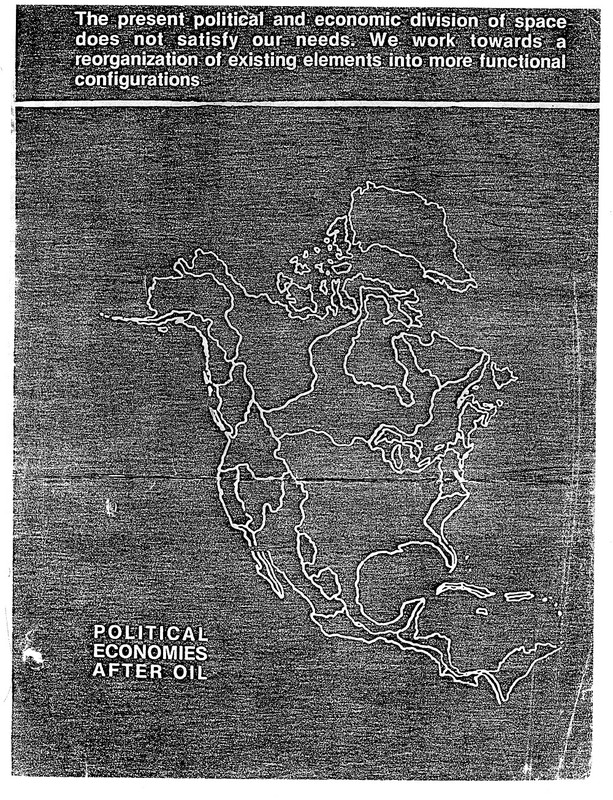 She also chose to cooperate with a gallery exhibiting the basin maps, the Peter Nadin Gallery, to co-produce an 11 x 17 white-on-black poster with a Fend drawing of North America in its saltwater basins, a word-stack by Fend as a title, “POLITICAL ECONOMIES AFTER OIL,” and a four-line heading by Holzer. She called for a “reorganization” of the “political and economic” space in North America. In the gallery, the drawing of a reorganized North America was painted on the floor, and on that painting were painted, in the same white color, the names of Lawrence Weiner, Peter Nadin, Louise Lawler, Dan Graham. Was everyone named endorsing such a new political and economic division of space? Was anyone wanting the “reorganization of existing elements” to be thus? As we all know, nothing like this “reorganization” of territories in North America has occurred since 1975. Such types of division, by ridgeline, were more common for centuries earlier. The basin of Hudson’s Bay, delineated as shown here, was the territory of the Hudson Bay Company, founded 1670. The original 13 colonies had as their western border the ridge, shown here, separating the Mississippi basin from the Atlantic Seaboard. Up until the early 19th century, the Continental Divide did separate the claims by competing empires. Upper and Lower Canada were fairly much the basin of the Gulf of St. Lawrence. Wars wiped out these divisions. These include the Revolutionary War, the War with Mexico, even the US Civil War. Maybe it’s feared that any attempt to move towards such “reorganiation of existing elements” would cause a war. Such fears have blocked open discussion about how the political economies of the US, Canada and Mexico, and maybe also Mesoamerica, could change in territory. The head of Russia’s top diplomacy school has predicted that these countries will break up, or reconfigure. He cites both economic and ecological pressures. Could his predictions become true, without (much) violence? Sweden and Norway separated along such lines, of one sloping this way, the other sloping that way, without a shot being fired, in 1905. Could such “reorganization of existing elements into more functional configurations,” with different slopes to different seas, also take place? And should it? We could ask Jenny Holzer now what she thinks. 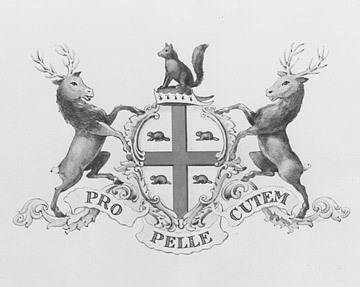 Or will the scenario of Ernest Callenbach remain, at least in territory, just a fable? Having dealt with US policy vis-a-vis alleged terrorists, could Jenny Holzer be asked about her contribution to this re-division piece, and whether she now thinks anything like it could, or should, come to be? The US, Mexico and Canada have formed a North America Free Trade Association (NAFTA). Why could not this be expanded, for all of North America, and then be divided into “political economies after oil”? Over the next, say, thirty years—when oil will largely be gone.